FreeMill is Free and Powerful CAM Software! FreeMill is a completely free milling program that runs inside of SOLIDWORKS. It can be easily installed on any computer that is running SOLIDWORKS version 2010 and higher and supports all standard milling machines and milling machine routers. The FreeMill browser quickly and easily guides you through the milling process, making it an excellent tool for small firms, engineers, and students. FreeMill is perfectly suited for handling simple milling jobs and is also a good way to learn about CAM software. FreeMILL comes with a demo version, manual, and several instructional videos on how to use the software. FreeMill supports both rough milling in multiple z level cuts and finish milling on complex 3D objects. You can mill multiple cutting directions in a single tool path while controlling stepover and stepdown distances. Other features include the ability to zero out at any point on the part or stock, support for end mills, ball mills and corner radius mill. FreeMill features three axis milling technology, perfect cutting complex 3D objects. FreeMill also includes tool path and cut material simulation, allowing you to visualize the entire milling process before machining. This makes it a great tool for engineering students and prototype production designs. FreeMILL is not a separate product but is a module that is included in VisualCAM for SOLIDWORKSand thus runs as a plug-in inside SOLIDWORKS. So make sure SOLIDWORKSis installed on your machine first before installing FreeMILL. 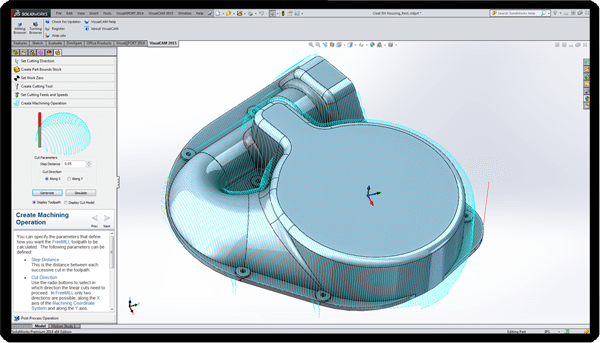 Note that even though you may choose not to purchase VisualCAM for SOLIDWORKS, you can still run FreeMILL completely free of cost, while the rest of the CAM product will continue running in Demo mode, that is, without the ability to save CAM data or post-process toolpaths.